Wine Education, Appreciation and Tasting workshops are designed by our Chief Trainer Gaurav Thapar to make the wine knowledge much more exciting and accessible to all the enthusiasts. These workshops are certified by Karnataka Wine board, Govt. of Karnataka Undertaking. First of its kind indigenous to India, perfected and taught to over 3000+ wine enthusiasts; this course has and will help those seeking the truth about the knowledge and skill required to handle the fluid poetry of wine in its most simple and easy to understand fashion. The WEAT workshops have been divided into three major levels, namely; Basic, Intermediate and Advanced. This ideal blend of art, science, and passion has been priced reasonably to accommodate all wine enthusiasts interested. Whether you are just a wine enthusiast or a wine professional, this program fits for both to improve your wine knowledge. A great program to start your wine journey and to become a wine pro. This 4-hour workshop will familiarize you with wine basics regarding the different styles of wine, the art of wine tasting, wine varietals and the concept of ‘terroir’. With around 10 different guided wine tastings and a certificate awarded by the Karnataka Wine Board, this workshop is the best bet for a novice to start wine journey. 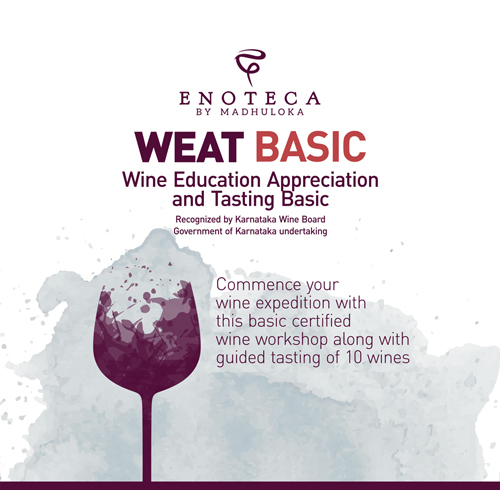 WEAT Basic is a certified workshop recognized by Karnataka Wine Board. Fee includes the half day (approximately 4 hours) presentation/class by Enoteca`s wine educator, wines for tastings and one-time tea and refreshments. Wines will be allowed to taste only to those candidates who are above the legal age of drinking. Workshop registration is nontransferable and nonrefundable. No prior knowledge of wine is required to attend this workshop. Enoteca by Madhuloka reserves all the rights to alter the terms and conditions without any prior notice. With an exam involved to be eligible for the certificate, this comprehensive full day (8-hour) course is for the folks who take their wine training bit seriously. This workshop is a combination of philosophy, science, and art behind wines and has in-depth knowledge involving every aspect of production, tastings, varietals, regions, service, storage, and food pairing. Detailed guided tastings of up to 15 different wines in a day and paying attention to the presentation at the same time sounds bit heavy; nevertheless, fun-filled sensory exercises, tastings, and discussions will not let you realize the time flying by. It would be a day worth spending. Keep up with the history & evolution of wine. Display an understanding of different grape varietals and wine regions. Comprehend and apply Sensory Evaluation of wines. Familiarize on storage of wines and wine service. An assessment consisting of 50 multiple choice questions will be given to test your knowledge & understanding about wines. It will be a closed book examination & the exam duration is of 50 minutes. You will need to answer at least 25 questions correctly to pass & obtain WEAT intermediate certificate. Upon successful completion you will receive either a WEAT Completion or WEAT Excellence certificate. Candidates scoring 50% or above will be awarded WEAT Completion Certificate and candidates scoring 80% and above will be awarded WEAT Excellence Certificate. Course Fee includes a one day (approximately 8 hours) presentation/class by our certified educator, study material, wine tasting, lunch and refreshments, exam and certificate fee. Full payment must accompany the booking form as we do not accept provisional bookings and seat in the course will only be confirmed once payment is received. Withdrawal from the course before 2 weeks will entitle the candidate for the refund of 50% of the course fee. Course fee will be refunded in full if Enoteca bt Madhuloka changes a course date or cancels a course. Transfers of a confirmed booking either to another identical course or applicant can be made if notification is recieved in writing up to 5 working days before the course start date and on payment of INR 500 administration fee per candidate. Within 5 working days prior to the start of the course, no refund or transfer of the course fees will be made. All transfers are subject to availability of alternative course. WEAT Intermediate level is a certified course from Enoteca by Madhuloka and, is recognised by Karnataka Wine Board, Govt. of Karnataka Undertaking. Candidate has to pass a 50 multiple choice questions exam with minimum 50 % marks to be eligible for the certificate. Candidate must appear for the exam within a week from the date of the course attended. A fail candidate can reappear maximum one time only for the exam. Any candidate who wishes to re-attend the full course can do so by paying 75 % of the new course fee. Candidate already in possesion of WEAT (Intermediate) certificate can not re-appear for the exam. Study material for the examination will be provided on the day of the course. Enoteca by Madhuloka has the right to cancel or postpone a course either in case minimum number of students is not reached or for logistical reasons. In these cases, the new dates will be communicated by email to the candidates.